A GSHP will cost more to install than traditional heating and cooling appliances, such as a boiler, furnace, or air conditioner. The cost of the installation will also depend on the size of the system, as larger systems often require a more expensive appliance and a larger ground loop. As described in step 7, GSHPs are typically sized by the ton, where 1 ton is equivalent to 12,000 BTUs of heating/cooling per hour. Larger heat pumps that need to provide more space conditioning will have a higher number of tons. not include the cost of installation or the ground loop. The ground loop can run from $10,000 to $30,000 depending on the type of ground loop and other site requirements. Thus, a 3-ton vertical well system could cost from $17,500 to $37,500 for the unit and ground loop. This rough estimate does not include the heat delivery system to the building. For retrofits, the delivery system will already be in place, and the price should be adjusted appropriately. There are several incentives to help businesses, agricultural producers, and homeowners install a GSHP. The federal government offers a renewable energy tax credit of 30 percent (for residential) and 10 percent (for commercial) for the installation and equipment costs (currently in place until December 31, 2016). Some states also offer incentives. To see if your state offers incentives, visit the online Database of State Incentives for Renewables and Efficiency http://www.dsireusa.org/. Additionally, many electric utilities offer financial incentives to encourage the use of high-efficiency heat pumps. To determine if a GSHP will be cost-effective, an understanding of local energy costs, both electricity and heating fuels, is vital. For example, what is the cost per gallon of heating oil? What is your price per delivered gallon of propane? What is the electricity rate per kWh? What about natural gas price per therm? Table 2 aids in tracking this information. In heating mode, a GSHP uses electricity to transfer energy from the ground to a higher temperature for delivery to the interior of a building. Consider the local price of electricity and other fuels over time – are prices expected to rise or stay the same? If the cost of electricity is relatively high compared to the cost of heating oil, natural gas, or propane, a GSHP might not be the most cost-effective option. Each energy source has a certain amount of heating content per unit that can be measured by a BTU. For instance, heating oil is typically 138,000 BTU/gallon, natural gas is typically 100,000 BTU/therm, and electricity is 3,413 BTU/kWh. The fixed coefficients (e.g., 7.25, 10.0, 293, and 11.1) are fixed constants that convert the units to BTUs. Simply insert the local price of fuel and the expected efficiency of heating appliances. Now, to calculate the payback, examine the operational savings compared to the added installation cost. are predicted to remain stable at $0.115/kWh. On the other hand, the payback over natural gas is considerably longer – longer than the life of the heating appliance. 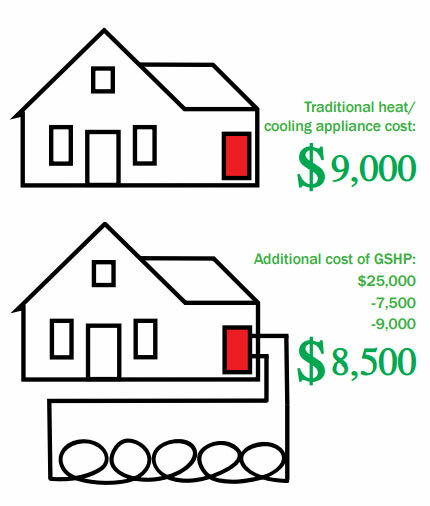 So in this scenario, a GSHP is not cost-effective to install. There may be other reasons to install a GSHP, such as environmental concerns or the volatility in natural gas prices. Still, the realtively low cost of natural gas makes the GSHP a challenging investment. Of course, the amount of annual savings depends on several constraints, which are different for each building. Also, the higher the cost of heating fuel alternatives, including natural gas, propane, and heating oil, the more attractive a GSHP will be. To understand yearly operating costs of a GSHP in your area, repeat the calculations and compare the values to other alternative fuels. Many installers have software that can run comparisons of different heating systems for you, so don’t hesitate to ask questions about the payback period of a GSHP.